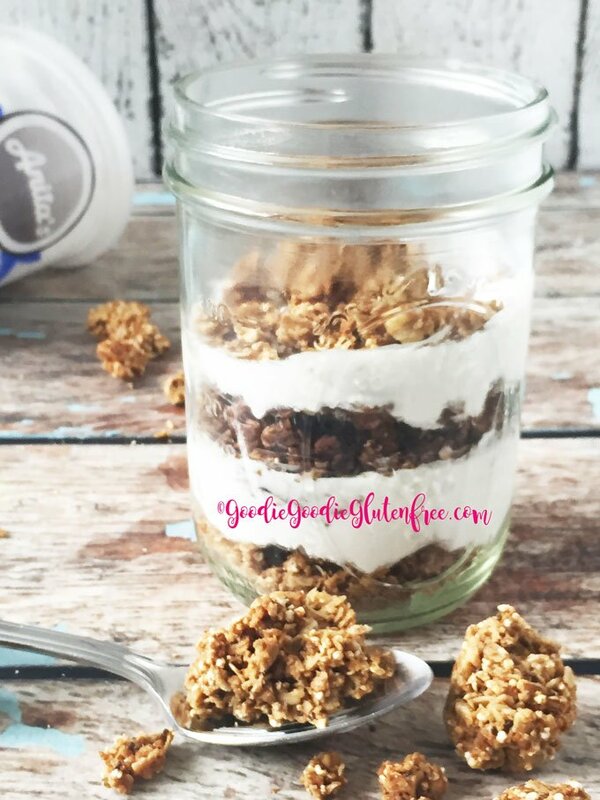 A hearty, crunchy and satisfying Dairy-Free Coconut Yogurt Parfait with two kinds of delicious granola! And yes, there’s chocolate, because what would a parfait be without chocolate? This treat is dairy-free, nut-free, gluten & refined sugar-free. A total treat! Ever notice that when you make a parfait it doesn’t quite turn out looking like those gorgeous pictures you see in cookbooks, by bloggers, and on Instagram? I mean they are SO pretty. Whyyyyyyyyy. But why tho? Why. It actually takes quite an eye for artistic color, composition and lots of tissues! Tissues? Yes. How do you think all those professional pics of parfaits look so pretty? Having some paper towels handy (as if you were working on an art project) makes this yogurt parfait look beautiful! So for the first time, I set out to make the parfait pretty with the paper towel method, voila! It’s really that simple. But without the paper towel? Total disaster. I mean I’ve tried many times to make my breakfast parfaits look pretty, but without that towel paper/tissue method? No cigar. 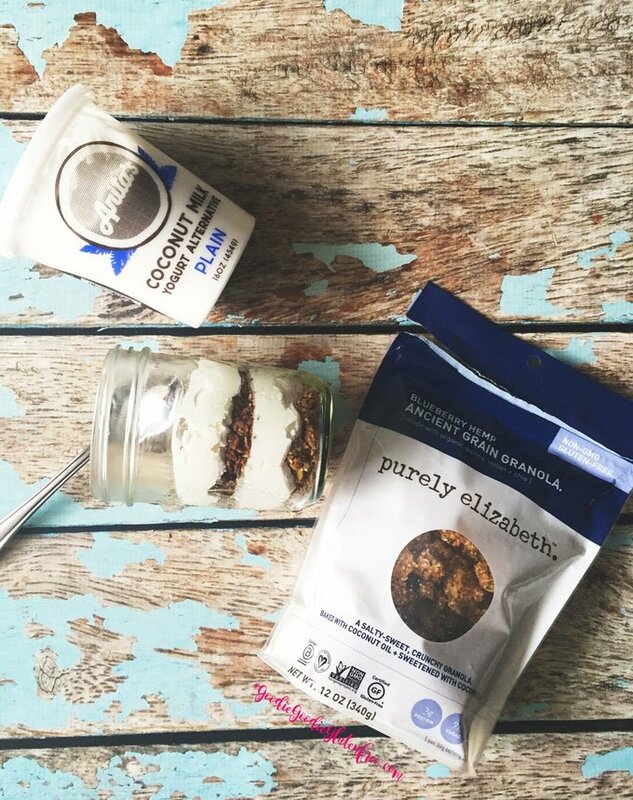 For this parfait and any parfait, I make for that matter is ALWAYS made with Anita’s Coconut yogurt and Purely Elizabeth’s granola. I used the nut-free granolas because of allergies and still – STELLAR! Anita’s Coconut Creamline yogurt is made from coconuts. There is no dairy whatsoever in this yogurt. It’s one of the reasons I love Anita’s so much in comparison to others. She uses the cleanest ingredients, and the ingredient list is super short. She doesn’t add any sugars or starches or thickeners to make this yogurt. It’s pure. 2-3 grams of sugar per cup tops! And Purely Elizabeth! I’ve been following the creator since she was at IIN! I didn’t even know what IIN was then, but I was a baker and I remember when she started. I remember when her baking mixes hit the supermarket shelves. I remember her debut. Elizabeth and her company have grown so so much and I die over their granolas! The two granolas I like are the nut-free ones. There are only 2 nut-free versions. Hemp Blueberry and Chocolate Probiotic. These two are fierce and pack a mean crunch! Imagine a sandwich of all those goodies instead of bread its crunchy granola, and instead of cheese, it’s tangy coconut yogurt! This breakfast will definitely satisfy you until lunch! You will surely be full of life after this delicious dish! Layer 1: Add 1/3 cup of Hemp Blueberry granola to bottom of the jar. Layer 2: Then add 1/4 – 1/3 cup of coconut yogurt on top. Use a spoon to flatten the layer out, and use a tissue to clean up the mess. Layer 3: Then add 1/2 cup of the Chocolate Probiotic granola on top. Layer 4: Then add 1/4 – 1/3 cup of coconut yogurt on top. Use a spoon to flatten the layer out, and use a tissue to clean up the mess. Layer 5: Optional – Top your parfait with additional granola, chia seeds, hemp seeds and whatever else your superfood heart desires. You can always use the coconut yogurt or yogurt of your desire, either sweetened or unsweetened. And you can use whatever type of granola you want. 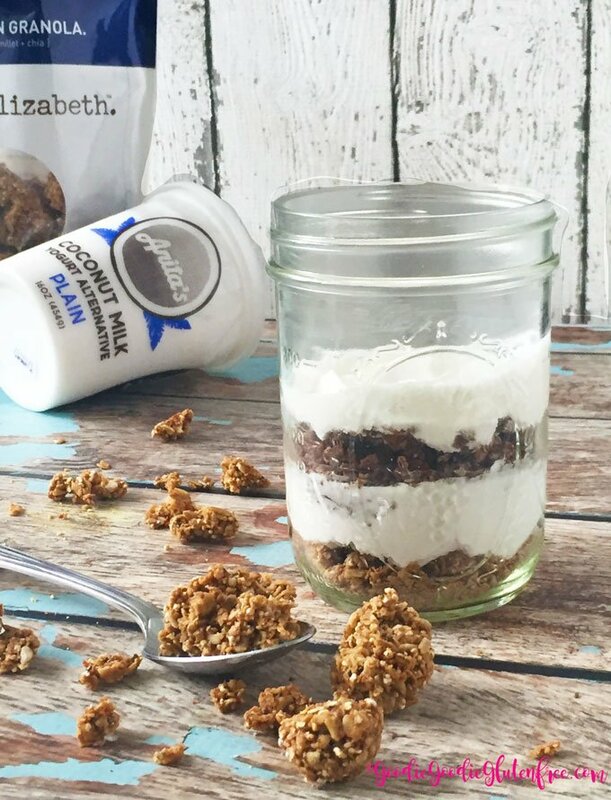 This version uses coconut sugar in the granola and 2-3 of natural sugars in the yogurt. This is the low sugar version. Enjoy! 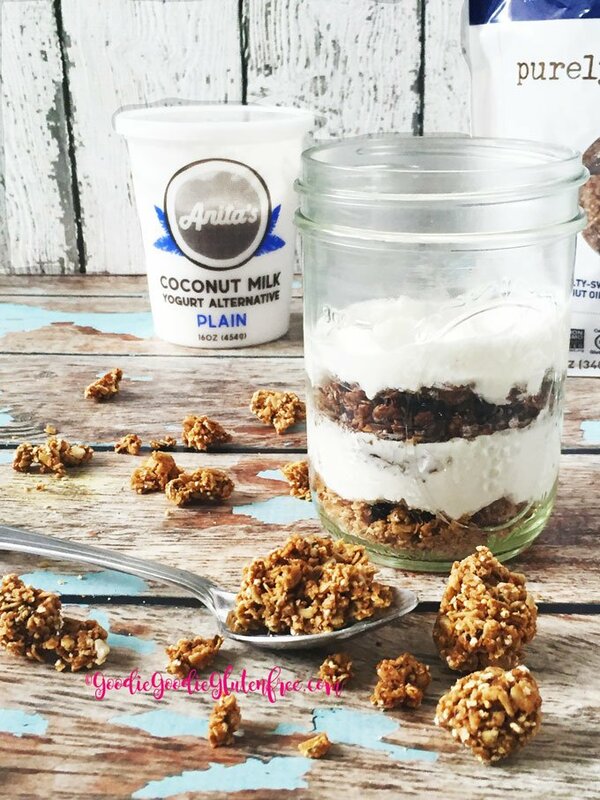 A hearty, crunchy and satisfying dairy-free coconut parfait with two kinds of delicious granola! And yes, there's chocolate, because what would a parfait be without chocolate? This treat is dairy-free, nut-free, gluten & refined sugar-free. A total treat! Layer 1: Add ⅓ cup of Hemp Blueberry granola to bottom of the jar. Layer 2: Then add ¼ - ⅓ cup of coconut yogurt on top. Use a spoon to flatten the layer out, and use a tissue to clean up the mess. Layer 3: Then add ½ cup of the Chocolate Probiotic granola on top. Layer 4: Then add ¼ - ⅓ cup of coconut yogurt on top. Use a spoon to flatten the layer out, and use a tissue to clean up the mess. Layer 5: Optional - Top your parfait with additional granola, chia seeds, hemp seeds and whatever else your superfood heart desires.